SOMETIMES MYSTERIES ARE NEVER SOLVED. SOMETIMES THERE ARE NO ANSWERS. Dr. Laura Pavlov, an American forensic archaeologist, is about to unravel a mystery that promises to shed light on one of the 20th century’s greatest enigmas. A member of an international team digging on the outskirts of the present-day Russian city of Ekaterinburg, where the Romanov royal family was executed in July 1918, Pavlov discovers a body perfectly preserved in the permafrost of a disused mine shaft. The remains offer dramatic new clues to the disappearance of the Romanovs, and in particular their famous daughter, Princess Anastasia, whose murder has always been in question. Pavlov’s discovery sets her on an unlikely journey to Ireland, where a carefully hidden account of a years-old covert mission is about to change the accepted course of world history and hurl her back into the past—into a maelstrom of deceit, secrets, and lies. 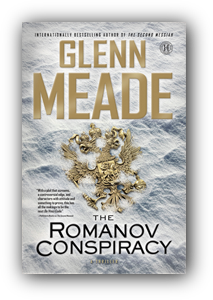 Drawn from historical fact, The Romanov Conspiracy is a high-tension story of love and friendship tested by war, and a desperate battle between revenge and redemption, set against one of the most bloody and brutal revolutions in world history. "Glenn Meade writes scenes as though they were shot from a gun, and the impact as you turn each page is often just as powerful."